Our team has been working in, and around gift cards, for decades and wants to bring this to Twitch to benefit the most charities possible. For years we've worked in and around the gift card industry but our main passion has always been about video games. Back in the days of Game Crazy, our team helped put together the gift card program for their 700+ brick and mortar retail stores. Since then, we've helped develop gift card programs for major brands like Nike and even became a support partner for the Retail Gift Card Association (RGCA) which manages best practices for the entire closed-loop gift card industry. When we attended Twitch Dev Days last year we were introduced to the developer program for extensions. The energy level of that group was through the roof and we were excited to get started on developing our first extension. It was only during the holiday when we received a wealth of gift cards for Walmart, Starbucks, and Barnes and Noble that the light bulbs went on. 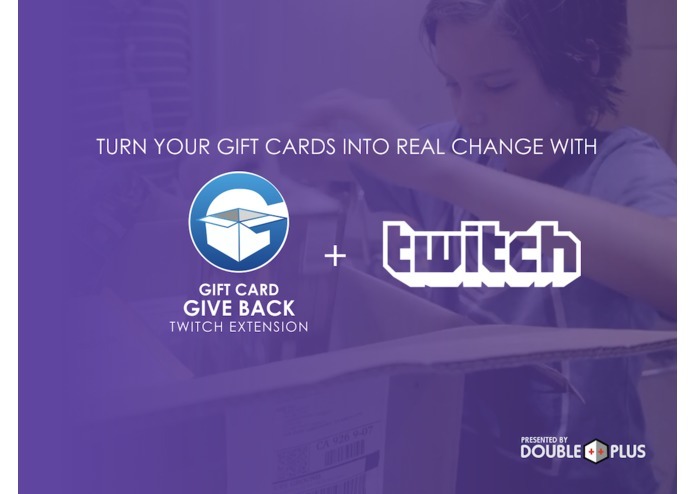 "Instead of simply donating these gift cards online, could we work with charities and streamers to bring that technology into an extension on Twitch?". We made a few calls to our friends in the gift card and payments industries and realized that the APIs were out there and that all we needed to do was tie them together in the sandbox. Additionally, we'd been working with streamers and charities looking to bring in additional donations during events and gift cards were a way to get those without a credit card to give to their favorite people and causes. We started in December and worked to get everything put in place in time for this competition. 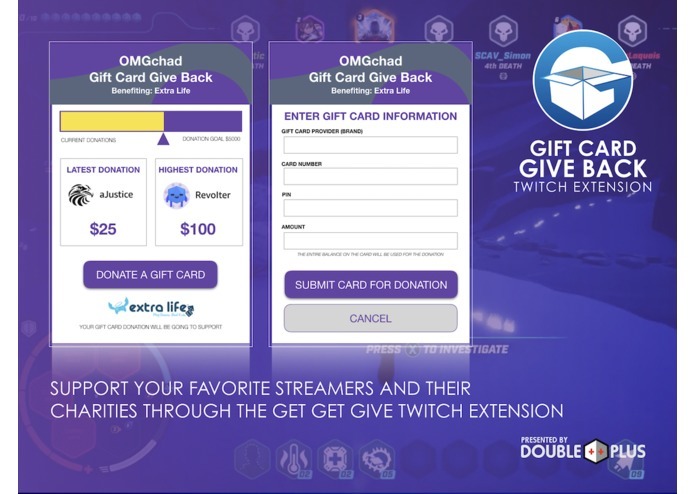 The extension allows Twitch streamers to accept donations for specific charities using gift cards from major brands like Starbucks, Walmart, Target, and others. Frontend done in HTML and jQuery. Backend done in CakePHP 3. Our team is comprised of game and web developers so we were incredibly excited to build something that brings incredible value to Twitch and provides a massive opportunity for charities to capitalize on a largely untapped philanthropic demographic. The biggest challenge was finding the time to get everyone together to get this project off the ground. We started conversations in December but had holidays, travel, and two gaming tournaments to launch. The rubber started to really hit the road in mid-January when we put a timeline for delivery together. Beyond that, the biggest hiccup was in getting our hands around the sandbox. 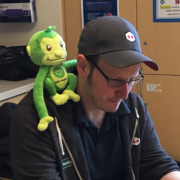 While we're skilled in jquery, html, css, and the like, our dev rigs were having connectivity problems off and on which caused a few delays in getting this submitted. We're still working out a kink with how notifications will display, but other than that, we're feeling good about how far we've come. Finding an untapped niche in a field full of incredibly talented developers feels incredible. Although we've worked in gift cards for over a decade, we never felt like we were fully engaged with the business side of that industry. Over the last three months, we've had more interest and excitement over what we're building and even have a few 'sports marketing' companies asking how they can get more actively involved with Twitch. It feels good to be a thought leader in a space we've been in for so long. If this gets approved, the accomplishments will be exponential as we'll be giving back to a massive number of organizations that are making the world a better place. We've learned that streamers on Twitch want to help charities more than we ever expected. We've talked to dozens of streamers connected to Extra Life, Childs Play, 1000 Dreams, and the ESA Foundation that have all asked how they can do more. When we shared what we were building, everyone we've talked to wants to try it out on their streams. On the other side of that equasion, we know charities all have a bandwidth problem when it comes to putting streaming events together. They WANT to participate but they don't have the personnel to manage events or setting up the donation side of a stream. We're thinking this solution will help many people on both sides of the puzzle which is why we're excited to bring this to the table. We are hopeful that this Gift Card Give Back extension will be as well received as our conversations have led us to believe. 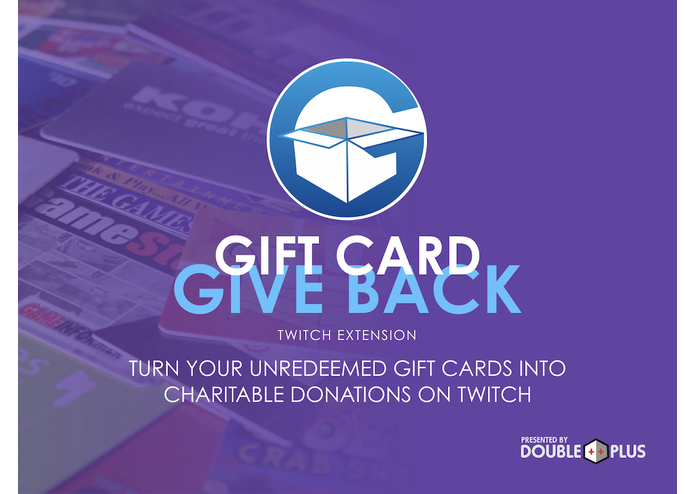 If we're able to help streamers and charities with donations, we'd love to open the door to helping more and more streamers with converting gift cards to subscriptions, bits, or digital/physical goods (merchandise). 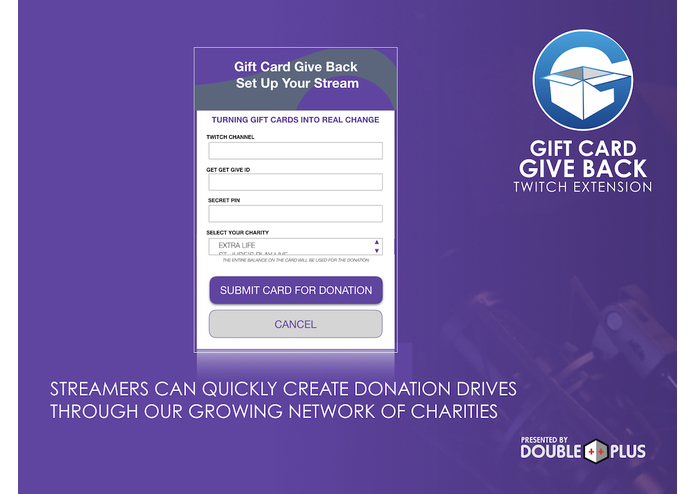 If we're talking 'the sky's the limit' here, we could even have gift card being applied to Twitch/Amazon accounts with a percentage still going to charity. Celebrating and connecting the best games, developers, people, and charities together to bring attention to, and solve, real world problems.